Protest - activism - denouncing - Mind the blog! I don't know you but I'm more and more stricken by the growing number of young people living in the streets with their dogs. Usually, I avoid looking at them. I'm not proud of it. I watched a documentary about the phenomenon and was really affected by it. I'd like to deal with the subject in class and I found some interesting documents. I just share them with you. The aim would be to make pupils aware of the reasons why young people "have" to live in the street. Then they would have to propose solutions (actional project) to fight against Youth Homelessness. If you don't personally know someone living on the streets, it's easy to pretend youth homelessness isn't a problem. It is a problem, and it affects millions of normal kids every day. It's time to wake up and pay attention. The National Coalition for the Homeless defines homeless youth as individuals under the age of eighteen who lack parental, foster, or institutional care. 1 out of every 3 homeless people are under the age of 18. Approximately half of all runaways were physically abused before fleeing home. The majority of homeless and runaway youth are between the ages of 15 and 17, however three out of 100 runaways are under the age of 10, and 11 out of 100 are between the ages of 11 and 13. A third of all runaways will attempt suicide. Homeless youth are up to ten times more likely to have or contract HIV than non-homeless adolescents. A tenth of homeless and runaway females are reportedly pregnant. This year, one in 260 runaways and homeless youths will die from assault, illness and suicide. Systems failure: mainstream programs like child welfare, juvenile corrections facilities and mental health programs. Former foster care youths are disproportionately represented in the homeless population. There are four basic types of homeless youth. Episodic (a.k.a. Couch Surfers), Eva. Early Intervention/Prevention: make sure a homelessness episode or a family separation doesn't result in long-term homelessness. Improve mental health and family systems. Independent Housing Options: to help youth who will not be able to return to their families. Jamie (Runaway) and Eva (Episodic) would benefit from early intervention, mental counseling, community-based services, and alternative family placements. Karina (Shelter Hopper) requires intensive family reunification services, case managers, or youth advocates or life skills training. Ryan (Street-Dependent) would be helped from street-based outreach and one-on-one connections; it's important for housing to provided first before tackling other issues. Data: how many youth are homeless, what their needs are, etc. Emergency prevention: crisis counseling, family reunification services, etc. Youth housing continuum: youth shelters, transitional housing, etc. Crisis Assistance Information to Youth: develop community-based outreach where young people are (like schools) to prevent homelessness. Affordable Housing: increase the number of affordable housing options for young adults (ages 16 to 25). Youth homelessness is a large problem, but by no means is it a hopeless one. If we try to understand the problem as a whole, we can begin to work toward better solutions. 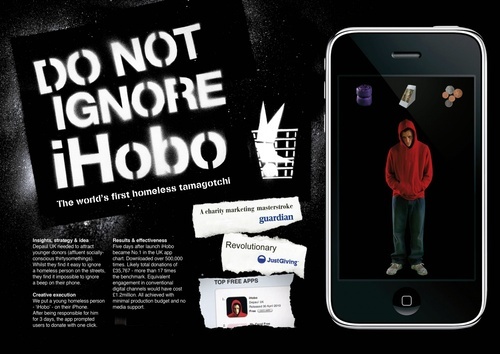 Meet the young homeless person who will be living on your iPhone for the next three days. You’ll need to be there for him, day and night, providing food, money, warmth and support. He’ll alert you when he gets into trouble or needs your help. And the speed of your response could be the difference between him making it through in one piece, or becoming addicted to drugs. 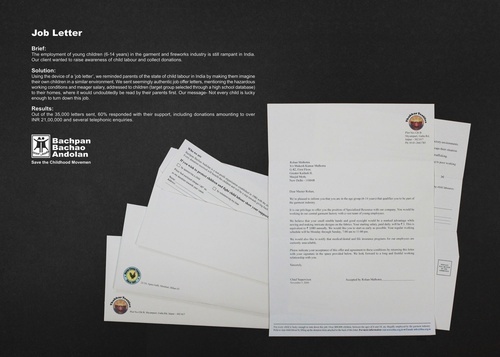 Very interesting campaign by Amnesty International. Unfortunately the site is no longer available. We could use the same concept to imagine other useful uses of youtube, facebook, twitter,etc. rather than using them for our own personal interest. Very striking campaign against child labour by Bachpan Bachao Andolan. Moreover you can study how to write a letter and how to use satire and irony.